Warrior, Rogue & Mage: Character sheet! 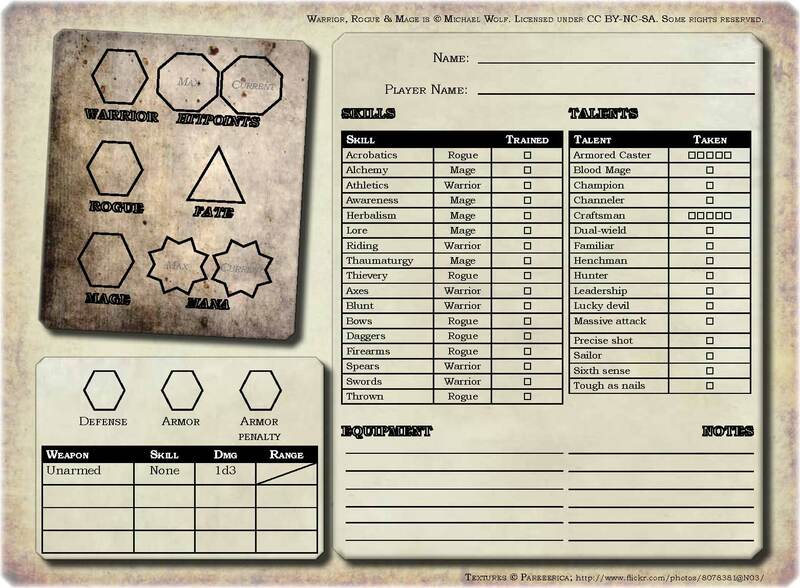 The character sheet can be downloaded as a PDF file on the WR&M product page at Stargazer Games. Previous PostWhat about ICONS? A review…Next PostYou want to get a free copy of Fantasy Craft? Here’s your chance! That is one gorgeous sheet, so pretty! I think it's cool. The only thing I would change is making anywhere the player has to write white. Or just off white. This is because printers sometimes print darker than you expect and 'grey areas' are invisible under pencil. I have terrible problems with the Corporation character sheet for that reason! @Rob: Hmm, that might be a problem. I will look into it.